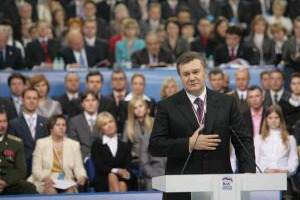 June 4 marked the 100th day of Ukrainian President Viktor Yanukovich’s term in office. In this brief interval, Ukraine’s fourth president has managed to radically change his country’s foreign policy priorities. Ukraine has gone from being Moscow’s most intractable and inconvenient partner to a Russia-friendly state. However, the great friendship between Moscow and Kiev appears to have its limits. At a press conference devoted to the first 100 days of his presidency, Yanukovich clearly outlined them. Like his “Orange” predecessor Viktor Yushchenko, Ukraine’s new head of state is not ready to recognize the independence of Abkhazia and South Ossetia. With this statement, Yanukovich put an end to speculation—at least in the short and medium term—about the possible recognition of Abkhazian and South Ossetian independence by the new Ukrainian administration. The first 100 days produced much speculation over Kiev’s approach to the Caucasus, and leading Ukrainian experts, such as Vitaly Kulik, believed that Yanukovich would recognize the separatist regions. “Certain experts and politicians are already analyzing the possible consequences of such a decision by Ukraine’s new president while the paparazzi have produced pictures of a building supposedly earmarked for the Ukrainian Embassy in Sukhumi. In Georgia people are worried that a visa regime will be instituted between Kiev and Tbilisi,” said Kulik. However, on June 4, the fourth Ukrainian president dispelled all doubts and suspicions. Despite a general warming of relations with Moscow, Ukraine is not ready to entirely share Russia’s approaches to and assessments of the Caucasus. Ukraine’s foreign policy ambitions in the Caucasus were defined long before the Orange Revolution. Ukrainian policy in this area has its own objective motivations. Seventeen years ago in April, Ukraine and Georgia signed an “Agreement on Friendship, Cooperation and Mutual Aid.” Official Kiev expressed a readiness to send Ukrainian peacekeeping troops to the zone of the Georgian-Abkhazian conflict, while stressing that such a decision could be taken only given the necessary UN Security Council resolution. According to the Ukrainian Constitution, the country’s armed forces may participate in peacekeeping operations only under the aegis of the UN. “We are ready in any framework to participate in settling the Abkhazian conflict, so long as that framework coincides with decisions by the UN and the UN Security Council,” said then-Ukrainian President Leonid Kuchma in December 2002 and again in April 2003 during a two-day visit to Kiev by Georgia’s Eduard Shevardnadze. Viktor Yushchenko tried to disrupt those approaches. He spoke grandly on many occasions as president about Kiev’s readiness to station Ukrainian “blue helmets” in Abkhazia and South Osetia. However, that sort of “family diplomacy” did not find support among Ukrainian deputies. Moreover, since 1990, Kiev and Baku have expressed their mutual interest in a broad spectrum of questions of economic cooperation—from transporting oil through Ukraine to buying Ukrainian-made oil-and-gas equipment. The activity of Ukrainian foreign policy in the Caucasus increased sharply following the success of the two color revolutions in 2003 and 2004. Yushchenko saw Georgian President Mikheil Saakashvili not only as a strategic partner and ally but as a politician who was “ideologically close.” Kiev’s course then was overtly unfriendly toward Russia. Yushchenko’s decree on the strategy of Ukraine’s national security clearly defined such threats as “the escalation of ‘frozen’ conflicts and the emergence of new regional conflicts near the borders of Ukraine,” while defining “active participation” in settling conflicts as a high priority in cooperation in the Baltic, Black Sea and Caspian regions. Today, however, Yushchenko is no longer president of Ukraine. Nevertheless, official Kiev is in no hurry to reject such legacies as the non-recognition of Abkhazia and South Osetia. Why is that? The foreign policy of Yanukovich, unlike that of his predecessor, is pragmatic and devoid of a confrontational spirit with respect to the Russian Federation — and with respect to the West. But that cannot alter the fact that contemporary Ukraine is a state that has existed inside its current borders only since 1954. It has yet to finish forming its political and ethnic elites. Consequently, Kiev is exceedingly sensitive to questions of separatism—be it in Georgia, Azerbaijan, Serbia or Moldova. Moreover, there is no other country in the Commonwealth of Independent States where foreign policy so seriously affects the internal political dynamic. And if for residents of Crimea and the Donbass the Kharkov agreement on extending the lease of Russia’s Black Sea fleet in Sevastopol was a long-expected event, then by Crimean Tatars and residents of Lvov it was seen as almost a national betrayal. Recall how differently residents of different regions of Ukraine reacted to the brief war in August 2008. Regional councils in Donetsk and Lugansk collected humanitarian aid for Ossetians, while the authorities in Galicia sided with Tbilisi. This explains Ukraine’s unwillingness to recognize the independence not only of two former autonomous republics of Georgia, but also of Kosovo. Thus in this matter Ukraine satisfies the interests of neither Russia (now striving for recognition of the independent status of Abkhazia and South Ossetia), nor the United States (which would like more countries to recognize Kosovo’s independence). Under Yanukovich, the Caucasus will remain a foreign policy priority for Ukraine. In this area, Kiev will not support Moscow’s aspirations one hundred percent. Whether realism and cold calculations in the actions of Ukraine will increase and national ideology decrease is another question.